Done, done, and done. I don’t know why I’m writing about Campbell now, particularly, except that his name, or the filthy story-telling laws that have become his legacy, have cropped up in a few different locations over the last few weeks, and I think it’s about time that “The Heroes Journey” becomes the quaint, antiquated notion of a plot engine that it was always destined to be. He was refreshingly valuable at one point, of course — much in the same way that Franz Boas was. 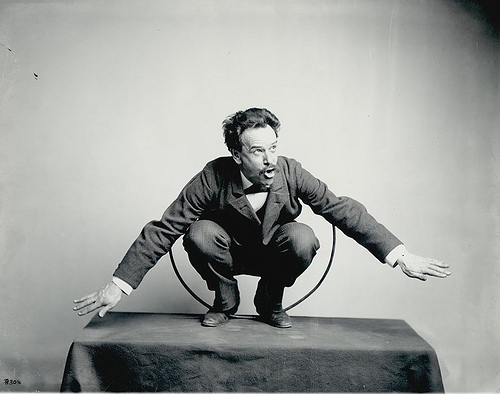 (Franz Boas was history’s Most Awesome Anthropologist; that’s him on the right, doing a cannibal eagle dance.) There was a need in post-colonial anthropology to recognize that other cultures are not the product of incomprehensible alien mutants, but regular human beings who resolved their existential and moral questions in much the same way that everyone else does. But Joseph Campbell (and James Frasier and Franz Boas) has already happened, as it were, and so there’s no need to dwell on him. And, of course, it’s not the social sciences that do, but the arts — the writers and the theater practitioners & such, because the arts are always about ten or fifteen years behind basic science. Somehow, the idea of a cultural archetype, of a universal “super-story” from which all other stories are derived, has become fascinating to actors and writers and directors, and it’s about time we ditched it. See, the most important element of Campbell’s work is that it’s not proscriptive, be descriptive. You can’t measure the quality of a story by comparing it to some Campbellian ideal of mythic purity; you can’t, in fact, even use it as the groundwork for a story — the more firmly you try and base your story in that mythic ideal, the more generic your story ends up looking. Because that’s exactly what “universal” means: generic. The appeal of seeing a story that is clearly the “Hero’s Journey” is not the statement that it makes intellectually or morally, not the questions it raises, not anything like that — it is the basic pleasure of seeing something that you recognize. Pleasure of Recognition is the easiest, cheapest, and most boring method of provoking a response in an audience; it’s the same motive force behind all those Scary Movie shitfests. It’s a fairly useless way to write anything, because it guarantees that you won’t depart from the generic. Ostensibly, most of this is not Campbell’s fault, and I only blame him personally (and hate him, personally) because it pleases me to do so; the fault lies in the people who’ve taken the Hero’s Journey and tried to use it as some kind of manual for storytelling. It’s not; it’s a lousy way to go about it. I have, by way of example, a friend who’d written a play, and he and I were discussing it at some length. In particular, the discussion focused on a particular character, and whether or not that character ought to be included in the final draft — his answer for it was essentially that “rival characters” appear in the mythic archetype, and therefore a “rival character” needs to appear in his play. There is no circumstance that should ever yield this conclusion; it is only the wild misuse of Campbell’s research that causes it. The fact is this: Campbell was either mostly right, or mostly wrong. If he was mostly wrong, then we don’t need to talk about him at all, fine, we’re done. If he was mostly right, we STILL don’t ever need to talk about him, or measure our work according to his laws — his essential premise is that because human beings are broadly similar physiologically and neurologically, then their cultures will be broadly similar, and their stories will be broadly similar. Those similarities are built-in on a basic, inextricable level. You don’t have to actively try and make your work conform to the Hero Archetype, you see, because whatever you write, you won’t be able to help it. In other words, Campbell’s conclusions are all fairly useless. It’s like saying, “Have you ever noticed that everyone tells stories with WORDS?” Yeah, great job, Joe. Now that we’ve gotten that crap out of the way, could you maybe come up with some means to help me make this story a specific, individual work? “Have you ever noticed that everyone that writes a story down uses their HANDS?” Thanks. Something, maybe, about how to make this story one that by its nature must be written, because it is distinct from those works to which it is similar? Oh, you think I should just ignore you and do it myself? Thank you for this! I too love Franz Boas and this reminded me of a sadly unfinished paper I worked on long ago about Katherine Dunham and Zora Neale Hurston as anthropologists. You forgot to blame him for George Lucas. I actually do enjoy playing with the “archetypal hero” myth from time to time in fiction, but it’s just that: playing. Campbell’s theories get taken far too seriously, if you ask me. You know who else always used “rival characters” in drama, though? Shakespeare. So your playwright friend’s foundation actually goes beyond and before Campbell. So does the foundation of much Western drama. I’m not sure Campbell (who meant a lot to me when I was younger, although he’s proven to be, like Kerouac or Salinger, the kind of literary influence I outgrow) entirely to blame for crystallizing an extant set of tropes into something like a storytelling system. I think, actually, that while many authors may be guilty of creating a set of extant tropes (though I don’t think that’s fairly a thing to be guilty of) Campbell is entirely to blame for crystallizing it, and for planting the idea that the closer we hew to that pure set of tropes, the better. I just want to be clear, in case my nameless friend happens to drop buy (or, by SCIENTIFIC DEDUCTION, one of you figures out to whom I am referring)–his play is fantastic. I am serious about that; I love it, it’s a great play. The particular element to which I’m referring is, I believe, a relatively minor sticking point, all things considered. I agree Campbell’s been overdone by many, myself included, as I realized quite recently, but the gem he left me with in this god forsaken age was the concept that we each have a singular journey to pursue; and to muster the courage to do that is the actual essence of ‘the hero’s journey’. Following Campbell , or anyone else, is of course a contradiction of what the man taught. One of the things I love about blogs is this: they provoke a thought in my brain. When that happens, I feel as I must comment expecting it’s beneficial to other people. Since there are various web logs with unique points of view, they question your comprehension. It is at these moments when you have fantastic insignt others might not have had, which include the blogger him/herself. I find myself coming back to to your blog site only because you have various brilliant insights and you happen to be at this a very long time, that is very exciting and tells me you know a lot. Keep provoking ideas in other people!